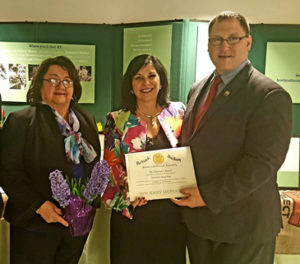 MaryAnne McMillan (left), immediate past president of the American Horticultural Therapy Association, looked on as Assemblyman Robert Andrzejczak (right), chairman of the Agriculture & Natural Resources Committee, presented Laura DePrado with the Chairman’s Award. Photo courtesy of Jonathan Atwood, legislative director. 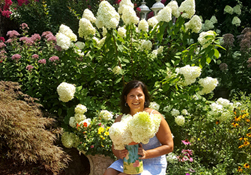 TRENTON, NJ — Laura DePrado of Branchburg in Somerset County, NJ, and president of Final Touch Plantscaping LLC received the Chairman’s Award from the Agriculture & Natural Resources Committee of the New Jersey Senate and General Assembly at the State Capitol, here, during celebration of Horticultural Therapy Week New Jersey. The award was presented by Assemblyman Robert Andrzejczak (D-1), chairman of the Agriculture & Natural Resources Committee, at the display showcasing horticultural therapy in Goldfinch Square. “The Chairman’s Award is new and meant to honor someone who is doing innovative work in the field of agriculture — work that is benefiting the residents of New Jersey,” Andrzejczak said in a March 27 press release.